We should be so lucky. al Reuters has the story. 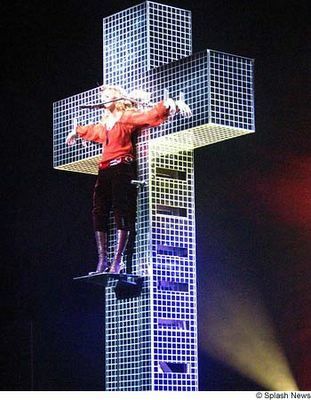 Madonna; still clueless after all these years. "Later on, she donned a crown of thorns and suspended herself from a giant mirrored cross to deliver the ballad "Live to Tell." Video screens showed images of third-world poverty and reeled off grim statistics." I wonder if any of the statistics she quoted involved the percentage of non-elected governments or state instituted religious practices in the countries featured in the above noted 'images of third-world poverty'. "Billboard magazine has forecast ticket sales could reach the $200 million range, making it the most successful tour by a female artist. Cher holds the record with $192.5 million from 273 shows on a "farewell" world tour that began in June 2002 and lasted almost three years, according to Billboard. "Madonna, on the other hand, is scheduled to play fewer than 60 dates on this tour. Similarly, her $125 million-grossing Re-Invention tour in 2004 and the $75 million Drowned trek in 2001 were also relatively brief. Perhaps the third world is poor because entertainers are hoarding all the money?